Fortunately, when I asked Mum, she said she couldn't remember a single thing about it. And it must be said that her principle reading for months after Dad got sick was one Agatha Christie after another, so perhaps a crime novel was a good idea after all. I'm a bit sad for Mum that her memory of this book has been wiped, because it's really good. 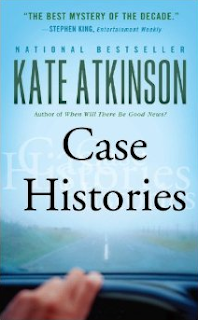 Kate Atkinson slots comfortably into that category of absorbing, engaging, intelligent fiction -- not pretentiously literary, not annoyingly dumb -- just a really solid, well-crafted, thoughtful, adult story. Anne Tyler, Liane Moriarty, maybe even Rumer Godden are other authors of this ilk who spring to mind. Case Histories deftly weaves together three seemingly unrelated crimes, with the emphasis on character, though the plot lines are strong too. And hooray, it's the first of a series of mysteries featuring ex-policeman, now private investigator Jackson Brodie, so I'm off to the library to dig out some more. PS Oddly enough, at one point in Case Histories Jackson and his daughter visit Bamburgh beach in Northumberland, which also featured in A Song for Ella Grey, as the camping site for Ella and Claire and their friends, and the place where they first encounter the mysterious Orpheus. Checking out some images on Google, it does look like a magical place. One of those odd reading coincidences! This is such a beautiful book, told in short, poetic chapters. I so wish my book group had chosen this title as our Music-themed YA novel for this month instead of The Sky is Everywhere; it is an infinitely better book in every way. 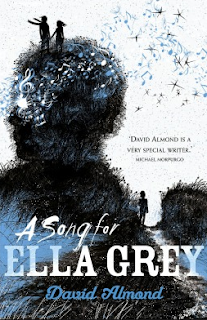 Alas, I fear that while The Sky is Everywhere is in danger of being read to death, few teens will pick up Ella Grey, which is a terrible shame. In its pages I saw reflected the intense yet loose adolescent friendship group of my 15 year old daughter: their hunger for life, their delight in each other, their adventurousness, their sharp edges, and their tenderness with each other. A children's book? Maybe not. But a book for kids who are ready/not-ready to grow up. Wow, a book so old that I couldn't find an image for the cover on the internet. That is quite an achievement these days! 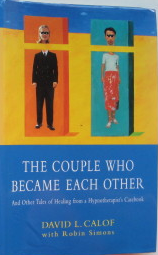 The Couple Who Became Each Other (and other tales of healing from a hypnotherapist's casebook) was published in 1996, clearly piggy-backing off the success of Oliver Sacks and Irvin Yalom's bestselling case studies. The difference here is that David Calof is not a neurologist or a psychotherapist, but a hypnotherapist. He helps his clients with hypnosis. I've had this book for years and re-discovered it when I dug out those other Irvin Yalom books. I felt quite conflicted reading it. In some ways, these stories mirrored Yalom's psychological case studies; Calof's clients present with similar problems -- troubled adolescents, people repressing childhood abuse, or struggling with a difficult marriage. But it seems to me there is a crucial difference in approach. While Yalom and his fellow psychotherapists build their therapy around helping their patients to become conscious of their inner conflicts and suppressed memories, so they can knowingly accept and overcome them, Calof relies on the unconscious of his patients to do the work without them necessarily knowing anything about it. In trance, he will summon some inner aspect of the patient, speak with them, and charge them with working on the problem, then wake the patient up and send them on their way, sometimes completely oblivious of what is going on inside. And it seems he gets results -- sometimes spectacular ones. But I can't help feeling uneasy about this knowledge remaining within, still unconscious, still hidden. It's almost the opposite of the aims of psychotherapy. And a lot of Calof's technique relies on inducing a sense of mystery, a sense that something unusual is about to happen, and the patient distancing themselves from the process, rather than bringing together and integrating warring aspects of the patient's psyche. Still, anyone who can help a patient endure a five hour facial operation without anaesthetic has earned my admiration. 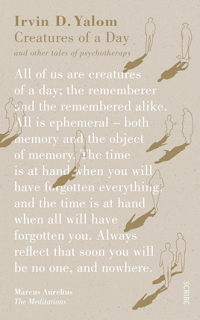 I found Creatures of a Day in the library when I was looking for Oliver Sacks books. I bought a couple of Yalom's books when I was younger, and coincidentally I dug them out recently because I thought they might interest Alice. Irvin Yalom is a psychotherapist and novelist, and he's published several volumes of these lightly fictionalised case studies from his therapeutic practice. They're easy reading, but insightful, and a pretty good introduction to how psychotherapy works. Dr Yalom is in his eighties now (when I last checked Google, he was still with us) and it's not surprising that the subject of death recurs frequently in this chapters. Some of his patients are themselves approaching death, or dealing with losses long ago, or just trying to figure out the best way to live. The most inspiring account here quotes one of Yalom's clients, dying of cancer, who resolves to be 'a pioneer of death' for her friends and family; since she is the first to go, she will be a model for them of how to die with grace and dignity, her final gift. Irvin Yalom shares with Oliver Sacks a deep concern for the whole person of the patient, not just their diagnosis, and reminds us that every person has their own unique history and story and way of interacting with their world. He is wise but full of humour and self-deprecation, admits his mistakes and is open about his methods. I hope he sticks around a good while longer. And so to the book that started it all -- The Man Who Mistook His Wife for a Hat, from 1985. It was strange to return to this first book of case studies; I noticed was a marked difference between this and the later volumes. This one is more earnest, less self-revealing, more academic, less conversational. 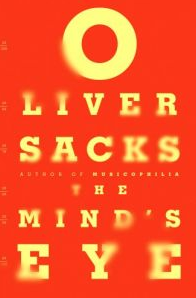 There is less of a sense of Oliver Sacks himself in these pages, and some of his reflections have a stilted, almost try-hard quality that he lost later on. I was uncomfortable reading the last section, "The World of the Simple," in which Sacks discusses "simpletons", "retardates", "morons.' As the sister of someone with an intellectual disability, these terms, though probably clinically accurate, made me feel very uneasy, even though Sacks argues throughout for a recognition of these patients as whole people, with skills and passions as well as disabilities. There was something fascinating from The Mind's Eye that I forgot to mention in my last post. Apparently the ability of humans to adapt to reading was something that much puzzled the early evolutionists -- without divine intervention (and perhaps forward planning on the part of the Almighty), how to explain the human brain's mastery of this complicated process? One theory is that the part of the brain adapted to interpreting landscape and geological features has been co-opted to assist in recognising the shapes of letters. Apparently there have been studies which show that all the world's different alphabets share the same basic forms and shapes, analogous to the shapes found in landscape: hills and rivers, mountains and trees. I just love that theory and I hope it's true! 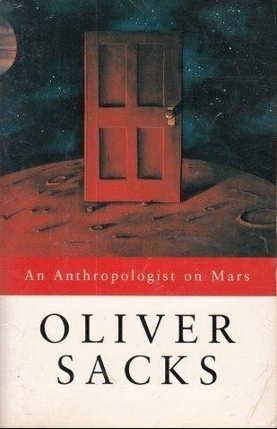 I'm really enjoying my Oliver Sacks binge. These collections of case studies are perfect holiday reading (for me anyway! ): the chapters are short, the cases are fascinating (and sometimes poignant), and the subject matter is often relevant to my interests. To wit*: The Mind's Eye, from 2010, contains a chapter on a woman with aphasia. Like my father, Pat found herself almost completely without spoken language after a stroke; unlike my father (so far), she was eventually able to adapt with the use of a 'Bible' of words which she used to initiate and direct conversations, and also lively use of gesture and mime. My dad is less outgoing than Pat, and while his speech therapists are working on getting him to use an iPad the way Pat used her 'Bible', it's had limited success so far. (Though there was an outstanding victory when we used a message on the iPad to ask the nursing home staff to turn off lights and close a door which had been bothering Dad terribly at bed-time.) Still, we perservere. There were also chapters on face-blindness, which I have a mild case of, and stereo vision, which I must admit is something I have never given a moment's thought to before. This was a really interesting study of a woman who acquired stereo vision late in life, and was overwhelmed with delight at the experience of perceiving depth for the first time, and seeing objects 'pop out' at her. I had to conclude that my own vision is relatively flat, in that I don't really see much difference between looking through one eye or two -- maybe this is why I've always been so crap at sport, and why I'm such a tentative parker of the car? Also I have a lot of trouble telling whether a goal has gone through at the footy -- all due to my lack of depth perception! It all makes sense now! All in all, an engrossing read. * You never see that any more, do you, to wit, I must use it more often. 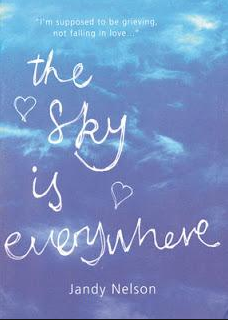 The Sky Is Everywhere, which I borrowed from the library for book group, has obviously been well-read and well-loved. The spine is supple, the pages are soft with the texture of paper that has been thumbed over and over. People -- teenage girls, let's face it -- clearly adore this book. In one sense, there is a lot going on in this YA novel: Lennie's beloved older sister Bailey has died suddenly, leaving her family and her fiance in shock. The sisters' mother is missing in action, having abandoned them years before. And there is a hot new boy in town, leaving Lennie confused -- how can she be interested in a boy when she's so immersed in grief? In another sense, not much happens at all: girl meets boy, boy likes girl, they play music together, girl has more feelings than she can handle, misunderstandings ensue... oh my god, the feelings. This is probably why this book is so popular -- it is dripping with emotion. No flicker of feeling is left undescribed. There is no restraint here. Even the adolescent poetry is included! I can remember being thirteen-fourteen-fifteen, swimming in an ocean of hormones and frustration and big emotions, and having nowhere to put them, and The Sky is Everywhere took me back there. But I don't think it's a country I want to live in any more -- in fact, I didn't much enjoy living there at the time, and I'm quite content to leave it behind. Long considered a classic in Scandinavia, Tove Jansson's The Summer Book is not a children's novel, though she is best known and loved for her Moomin books. First published in Finland in 1972, it is a small, exquisite treasure of a book, like a pebble picked up on a beach. The tiny island in the gulf of Finland where the family spend their summers may be small, but it forms a whole world for six-year old Sophia, her Papa (largely in the background) and her grandmother. Sophia's mother is dead (we learn this almost as an aside, and it is never spoken of again), but Sophia's unspoken fears and longings are woven into the tapestry of the book along with Grandmother's quiet, dry reflections and memories of her own long life. Grandmother and Sophia don't always get along; there are quarrels and storms, misunderstandings and awkwardness. But there are small shared joys, too, when they construct a model Venice together or find hiding places in the bushes. 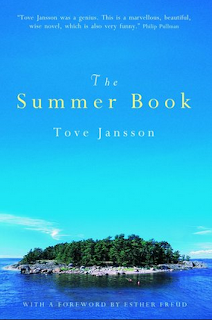 Based on Jansson's own mother and niece, and her own island experiences, the book proceeds through twenty-odd short chapters, each self-contained, like seashells arranged on a windowsill; but together, they tell the story of a summer, or several summers -- it doesn't really matter. The rhythms of life and death, growing older, work and leisure, sigh in and out through the pages like the tides. This is a beautiful, wise, tender book, never sentimental, and frequently funny. 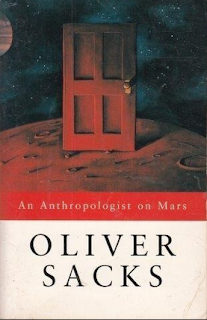 I found An Anthroplogist on Mars at my parents' house -- I'm not sure where it came from. Did I give it to Mum as a present? Or leave it behind on a visit years ago? It was published in 1995, and if I was responsible for bringing it into the house, I can't remember. Oliver Sacks died in 2015, and I was very sad to hear of his passing; I always enjoyed his writing, and I was glad to reacquaint myself with this volume of case studies. The chapter that I remembered most clearly was the last, on Temple Grandin, the autistic professor of animal science and gifted designer of animal handling equipment. But the other people featured are equally fascinating: a man who has his sight restored after years of blindness, but finds that his brain can't actually learn to see again; an artist who obsessively repaints the lost village of his Tuscan childhood; a surgeon whose Tourette's tics disappear when he operates. In some ways this book reminded me of The Brain That Changes Itself, though in many cases neuroscience has advanced, as one would expect in twenty years. Sacks does speak of the brain's plasticity, but even I know that research on autism, for example, has developed markedly since this book was first written. But in another way, this book has not dated at all, because Sacks is always interested in his subjects as people, first and foremost. He spends time with them, talks with them, tries to find out what it feels like to experience life the way they do. We enter into their lives, sometimes briefly, sometimes over a period of years, and are left wondering, how would I deal with this situation? What would I make of it? Some people use their challenges to create art, or to invent; others retreat, overwhelmed. Sacks has written a marvellous combination of science, psychology and reflection on humanity. I must hunt out the books I haven't read. 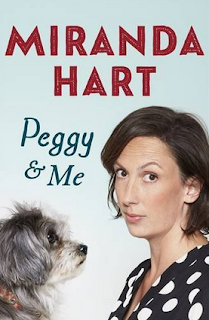 We ADORE Miranda Hart at our house; her self-titled sit-com is one of those rare things that we can all enjoy together 'as a family,' as it very much were (slipping into Miranda-speak there). There is something about Miranda's loveable awkwardness, her very English self-deprecation, that we all relate to. We went to see her stand-up show when she was in Australia a couple of years ago, though Evie was the youngest person in the audience by several years, and it was a fabulous night. So now Miranda has written a memoir about her gorgeous dog Peggy -- what a perfect Christmas present for Evie, and obviously Father Christmas agreed. Poor Miranda actually wrote this book twice -- the first time she finished it, her laptop was stolen just before she sent the final manuscript to her publisher! What a nightmare. But this re-written version is a sweet, funny, surprisingly philosophical read. Miranda has learned many lessons from Peggy, which other dog-owners will relate to: mindfulness, relaxation, playfulness, and even trust in a higher power. She acquired Peggy at a low point in her life, and found that caring for her dog re-connected her with the world and helped to lift her out of depression. This is just a lovely, light book, like having Miranda chat in your ear -- and charmingly illustrated with pencil sketches. What-I-call, an absolute treat. The Ten Gifts is an anthology of Elizabeth Goudge, focusing on her novels for adults, and while there were some extracts I'd read before, there were many I had not. Inevitably this involved spoilers of several plot-lines -- maybe this is why anthologies like this aren't too popular! 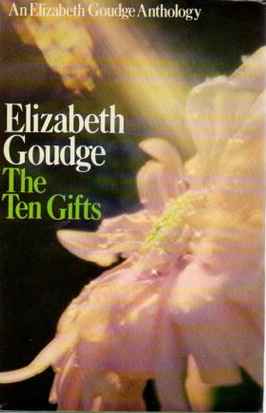 -- but since I don't read Goudge for the storylines, that doesn't matter much. The anthology was divided into ten sections, 'Love', 'Courage', 'Tranquillity' etcetera, but many of the pieces chosen could have slotted into more than one category. Most were wise, many were reflective, some amusing, and a few, alas, were very dated. I read them in a dreamy, meditative state, almost like praying, over the three days of our holiday, and relaxed and refreshed my mind and my spirit just as much as my body. * Among the teeming hordes, we came across Western Bulldog celebrities Mitch Wallis AND Peter Gordon! The beginning of a new year finds me in a reflective mood, so what better choice for my first book of 2017 than a novel by Marilynne Robinson, one of the authors I most admire. Though she's written only four novels, they each contain such depths that I could study them forever. 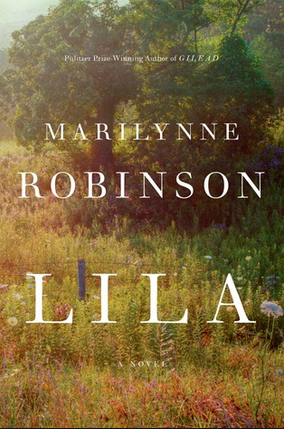 Lila is the third book to deal with a small cast of characters living in the tiny Iowa town of Gilead in the 1950s, but this one has a very different voice. For the first time John Ames' much younger wife, Lila, a fleeting, mysterious figure who has appeared only at the edges of the other novels, takes centre stage. Lila has suffered a difficult life; she is damaged, wary, mistrustful. But when she encounters Reverend Ames, 'that good old man,' it is a gift of unexpected grace and love for both of them. Gradually the story of Lila's previous life is peeled back; very slowly she learns to love and, much harder, to allow herself to be loved. Gilead, Home and Lila form an extended meditation on what Ames calls 'the mysteries of existence,' and there are no easy answers. Ames, his old friend Boughten, Boughten's estranged son Jack and dutiful daughter Glory, and now Lila, all find their own reasons for carrying on. There is always pain and loss, sacrifice and betrayal; but there is also tenderness and passion, kindness and beauty, the sweetness of the seasons passing. As I sat down to write this post, I spilt coffee over my copy of Lila, and also on Gilead, which I skim-read again last night to remind myself of how Lila appears in that novel. I can't tell you how cross I am with myself for spoiling these beautiful, thoughtful books with my carelessness. But in a way, it seems almost fitting to the message they carry that the books themselves should now be marked and imperfect, but still precious to me.